Furthermore, it is due to this connectivity that devices together produce enhanced potential to automate operations remotely. Being done by enhancing seamless communication. Hence skills required for IoT developer is also increasing. Examples of IoT are Smart Homes, driverless cars and modern offices. Moreover, it is predicted that by 2020, there will be thrice as much IoT devices as the population of the world. Therefore with such increased prevalence, the importance of you developing IoT skills are in greater demand. Equally, companies nowadays seek professionals with highest skill sets in the domain of IoT development. Therefore, this article will guide you through the mandatory skills of IoT development. This is vital among the skills required for IoT developer. You should prove your skills in knowledge of wireless communication systems and embedded logic. Additionally, you should also know what triggers the functionality of what. Furthermore, sensors should be able to detect position, pressure, flow, acoustics (sound waves), humidity, light, and temperature. Therefore, the most functional and accurate sensors will be invaluable contributors to the future of IoT. As an IoT developer, you should possess the skills of analyzing and gathering a huge amount of data. This will be useful for deciphering the pattern and predicting the outcome. 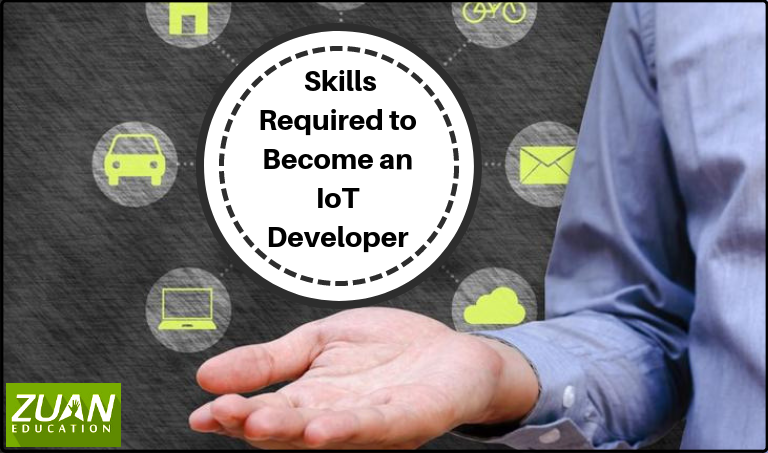 These are important skills required for IoT developer. Because of various complexities, AI is used for handling the tasks and autonomous decisions are made with the help of AI. Likewise, the algorithms of machine learning are used for the creation of smarter appliances with the help of data sensors. You should have the skills of machine learning and big data management. It will be useful for analyzing predictions based on the identification of data patterns. You would be required to harvest data from the sensors and connected devices. Objects in the Internet of Things comes in different shapes and size. Some will have very small screens, and others will have no visual display at all. The talented user interface (UI) and user experience (UX) designers will be an asset in the IT industry. IoT providers have to strive to develop effective, user-friendly interfaces. This is one among the mandatory skills required for IoT developer. Trained skills as UI/UX designers in the IoT include Responsive Web Design and Service Design. If you are a novice in these languages, you may need to hone your skills first in these programming platforms. And then embark on developing IoT solutions. Because this is among the compulsory skills required for IoT developer. Node.js is an IoT platform used by developers that build IoT applications. It provides an open source environment for web development of servers. Node.js is used to manage various connected devices, such as Raspberry Pi and Arduino. It is the preferred platform of choice for several companies. Specifically, those that have low resource overhead. Some large and well-known enterprises like Netflix, Uber, and PayPal resort to the use of Node.js. Raspberry Pi is one type of tiny computers and it is not more expensive. Therefore, it is the greatest way to learn how to solder together simple circuits, and link those circuits with the software. Big Data will assist you in collecting relevant data and filtering out redundant information. Moreover, this process requires a highly efficient mechanism that includes key factors like AI and other software. AI, when combined with big data, enables you to carry out your functions more quickly and efficiently. With this in mind, companies are on the look-out for skilled data scientists and back end engineers. You will develop algorithms, and collect, analyze, and architect unorganized data in a more efficient manner. Several businesses and consumers are using location-aware devices. Therefore, this technology is used in smart vehicles, logistic companies, and wearable apart from routing. Furthermore, you as a professional who can develop GPS enabled technology for IoT applications will be in high demand. You should possess the required knowledge in the field of GPS. To prevent IoT application malfunctioning during the activities. Moreover, any bad effects can cause issues related to location tracking. Due to the interconnected network of things of IoT, there will be a large amount of data to handle. A preferable way to address this issue is to resort to cloud computing solutions that can help host excess of data. In the IoT industry, you will be required with knowledge in cloud computing technologies. For the purpose of effective analysis-ready data storage and management solutions. Documenting information security and privacy concerns related to IoT data collection, aggregation, and analysis. You now have a clear picture of what is needed to gain footing in IoT. Software developers who deal with business intelligence should be careful in developing and honing their skills in IoT. Many streams of business, IT and electrical engineering have started producing and promoting IoT devices. Your skills in IoT would be helpful in many ways such as vulnerability assessment etc. You can improve your efficiency in IoT by specifically learning the course in an IT institution. And if you’re especially a Chennaite, you can learn IoT course in Chennai from many professional centers.